Publishing@SFU is thrilled to support the fabulous Indian Summer Festival (July 6–15, 2017) again this year! We’re happy to present 5×15/Constellations at The Vogue on the evening of July 15th. Five Speakers, Fifteen Minutes. Magic. Indian Summer Festival’s Closing Night kicks off at 7:30pm with our favourite speaker series, 5×15, followed by Constellations featuring a mix of musical delights from 9:30pm onwards. This ticket includes both events for an entire evening of cultural feasting. 5×15 is a speakers’ series that originated in London and has since spread to New York and Milan. It features five stellar speakers, speaking for fifteen minutes each on a topic they are deeply passionate about. The only rules: the talk should be unscripted, and fifteen minutes long. 5×15 has hosted speakers such as Gloria Steinem, Ben Okri, Brian Eno, Malcolm Gladwell, Eve Ensler and Ahdaf Soueif. 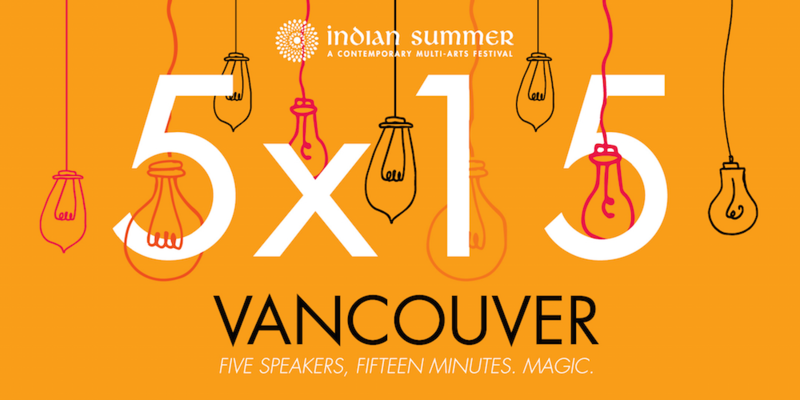 For the past three years, Indian Summer Festival has hosted the only Canadian iteration of 5×15. Talvin Singh is a tabla player, electronic musician, DJ and music theorist known for his pioneering work in the Asian Underground scene in London. He is an inspiration to many across the globe. Rock star, writer and humanitarian Bif Naked has pushed the boundaries of acceptability in her screaming loud creative work making her a cultural icon and a true Canadian legend. Graphic artist Molly Crabapple has drawn in Guantánamo Bay, Abu Dhabi’s migrant labor camps and with rebels in Syria. Her work is in the permanent collection of the Museum of Modern Art. Former revolutionary Carmen Rodriguez is a Chilean-Canadian author, poet, educator and political social activist. She is currently the writer-in-residence at the historic Joy Kogawa House. The evening is hosted by the brilliant comedian Kalyani Pandya, described as “Ottawa’s funniest Dyke”.